Between Disney: Between Books - One Little Spark! Between Books - One Little Spark! I have used “Mickey’s Ten Commandments” crafted by Marty Sklar quite a few times in my professional career. It is ten concepts that one can easily apply to a number of creative endeavors, and even if you make widgets you are creating something. So needless to say a book describing Mickey’s Ten Commandments by their originator had my attention, and my money. One Little Spark! 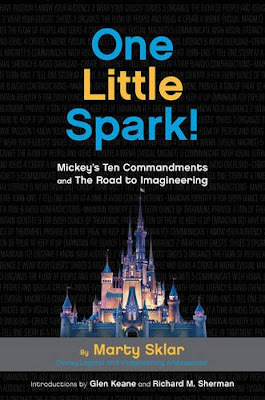 :Mickey’s Ten Commandments and the Road to Imagineering by Marty Sklar is really two books with one title. The first book is a summary and explanation of “Mickey’s Ten Commandments”. Sklar gives each commandment a chapter in which he explains its meaning, provides an good example (which he gives a Mousecar) and a bad example (to which he gives a fictional Goof award) and sprinkles in his own expertise. All of the examples come from Disney Theme Parks, including those things he believes failed the principles. The second book is Sklar distilling the wisdom of 75 current and former Imagineers on the skills needed to be an Imagineer including passion, a love of learning and curiosity. I do not really want to say this. But I really wish this was two separate books instead of one. The content is like Epcot, two very different things pushed together. Yes, Sklar has proven to be a master of this concept. But here it really does not play well for me. It basically does not feel like a mashup that fits together. Maybe it does not have a transition that works for me since really the whole book could be seen as an Imagineering toolbox. Or it could be the two very different presentations. But I found myself obsessing about “Mickey’s Ten Commandments” while not showing interest in the road to Imagineering. Maybe it is my stage of life, being an professional not bright eyed youngster. Also I really did not enjoy the block quotes used in the road to Imagineering segment. I really would have preferred more Sklar and less everyone else. If anything I will say that Sklar is honest. And despite being a Disney Editions book he does not pull punches. There are attractions which he gives a Goof award to which will shock you. And despite some of these are classic attractions beloved by millions, he has good points about how they have failed to follow Imagineering’s creative principles. And one must remember that Sklar was a key developer in some of the “failed” attractions. One Little Spark! :Mickey’s Ten Commandments and the Road to Imagineering is a book I will reference throughout the next few years. And Sklar has given me more background to support my professional use of his principles. But honestly I would have preferred two smaller books, using more of Sklar’s voice, to quench my thirst on this creative topic.